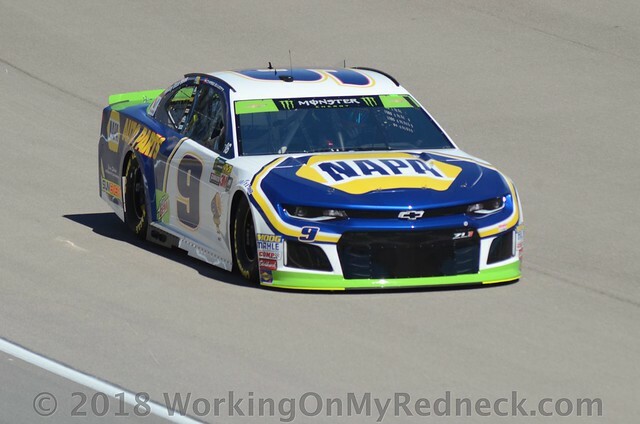 Chase Elliott powered to victory Sunday at Kansas Speedway, as the Round of 8 was set in the Monster Energy NASCAR Cup Series Playoffs. Elliott led the final 44 of 267 laps in Sunday’s Hollywood Casino 400. His Hendrick Motorsports No. 9 Chevrolet was .903 seconds ahead of Kyle Busch at the drop of the checkered flag as Elliott claimed his third win of the season and the third of his premier-series career. The win was also Elliott’s second in the last three weeks. Busch held on for second place in the Joe Gibbs Racing No. 18 Toyota. Kyle Larson snagged third place with Erik Jones fourth and defending series champion Martin Truex Jr. fifth. Can you hear the siren blaring above the pool hall in Dawsonville, GA? Well, rest assured that it has been wailing ever since the checkered flag flew at the Kansas Speedway! There are two players who are loving that siren sound! Riding shotgun with William Clyde Elliott, Jr., aka Chase Elliott is unlikely duo of Jim, aka Chiefy and his nephew, Jeremy The Coach. Both players racked up a very nice 48 points to add to their late 3rd segment totals. It was not only Chiefy and The Coach who racked up 48 points this week, but Snoopy Dawn and Leon Your Most Humble Sheriff added that same point total to their segment. Unlike Chiefy and The Coach, Snoopy and The Sheriff were rooting for Kyle Busch this week who also put 48 points up on the board via stage and race points. Both Lonna The Quilt Angel and Carole, aka Rudy, logged a nifty 47 points this week from different drivers. The Quilt Angel was rooting and hollering for Ryan Blaney, while Rudy was putting all her marbles in the sack of Joey Logano. Meanwhile, Amber The Extremely Lucky Cheddar Head was just that this week, extremely lucky! She hooked her wagon the that of “That Jones Boy”, Erik. Jones had a really good afternoon, bringing it home in fourth place at Kansas and giving her 40 points. Rounding out the top five scorers this week is a trio of players who were backing Martin Truex, Jr. That trio consists of Kathy The Church Forecloser, A&M Aggie Sue, and Zee, aka Sissy. All three ladies added 33 much-needed points this week. Only two players, Bernie The Bay Area Bandit and Zee, aka Sissy remained in their previous positions. There was large scale movement from within, but the number of places moved were very small this week. The largest movers of the week was a quartet of players, Leon Your Most Humble Sheriff, David The Mudslinging Throttle Jockey, Carole, aka Rudy, and Lonna The Quilt Angel, all moving three places. Your Most Humble Sheriff, Rudy, and The Quilt Angel all stepped up three (3) spots to sit in 3rd, 13th, and 19th, respectively. Conversely, The Mudslinging Throttle Jockey slipped down to 6th place. Moving two places this week is a foursome consisting of Jim, aka Chiefy, Dan The Numbers Cruncher, Carlton The Doorman, and Edie The Las Vegas Super Star. Chiefy motored up two places to sit in 5th place. Unfortunately, The Numbers Dude, The Doorman, and The Las Vegas Super Star all stumbled and fell down two spots to rest now in 7th, 14th, and 21st positions, respectively. This week Edie The Las Vegas Super Star was only able to gather up 13 points from her choice, Daniel Suarez. Those 13 points set he apart from the rest of the players this week and give her the rights to “The Crappiest PIck of The Week” award all by herself. We finally have a new player in “The Outhouse”! It took eight races to finally evict The Quilt Angel from her segment long resting place! It took a wiley and grizzled veteran like Ol Skid-Marc to make a strong run at “The Outhouse” This is not Ol Skidz first rodeo! No, he has spent many-a-moon inside the confines of The Outhouse over the years! With four drivers just eliminated from the Playoffs at Kansas, their dreams have been shattered. Next week NASCAR will feature the last short track race of the year from the smallest track on the circuit, Martinsville. Check out the results of the Hollywood Casino 400 at Kansas. TIL NEXT TIME, PULL YOUR GLOVES UP, FLIP YOUR VISOR DOWN, AND LET’S GO RACING’!